New method could help to reconnect injured organs or build functional human tissues from the ground up. Boston, Mass. — A team of researchers at the Wyss Institute for Biologically Inspired Engineering at Harvard University has found a way to self-assemble complex structures out of bricks smaller than a grain of salt. The self-assembly method could help solve one of the major challenges in tissue engineering: regrowing human tissue by injecting tiny components into the body that then self-assemble into larger, intricately structured, biocompatible scaffolds at an injury site. The key to self-assembly was developing the world’s first programmable glue. The glue is made of DNA, and it directs specific bricks of a water-filled gel to stick only to each other, the scientists report in the September 9th online issue of Nature Communications. “By using DNA glue to guide gel bricks to self-assemble, we’re creating sophisticated programmable architecture,” says Peng Yin, Ph.D., a Core Faculty member at the Wyss Institute and senior coauthor of the study, who is also an Assistant Professor of Systems Biology at Harvard Medical School. This novel self-assembly method worked for gel bricks from as small as a speck of silt (30 microns diameter) to as large as a grain of sand (1 millimeter diameter), underscoring the method’s versatility. “It could work for anything where you’d want a programmable glue to induce assembly of higher-order structures, with great control over their final architecture — and that’s very exciting,” said Khademhosseini, who is also an Associate Professor at Harvard-MIT’s Division of Health Sciences and Technology (HST), Brigham and Women’s Hospital, and Harvard Medical School. Scientists have tried to mimic this manufacturing strategy by developing self-assembling systems to fabricate devices. For example, last year Yin and his team reported in Science that they had developed miniscule “DNA bricks” smaller than the tiniest virus that self-assemble into complex nanoscale 3D structures. Now, he and Khademhosseini sought to create a similar programmable, self-assembling system for mesoscale components — those with edge widths ranging from 30 microns to 1000 microns (1 millimeter). They focused first on creating a system in which bricks of biocompatible, biodegradable gels called hydrogels self-assemble into complex structures. For future applications, small hydrogel bricks containing human cells could potentially be injected into the body. The bricks would assemble, then the cells would knit together to form functional tissue as the hydrogels break down. DNA was ideal for the task. It stores genetic information as a sequence of four chemical “letters,” or nucleotides, that bind in a specific way to complementary nucleotides (A to T, and C to G). A single strand of DNA adheres tightly to a second strand, but only if the second strand has a sequence of nucleotides that is complementary to the first. And even a short piece of DNA can have a huge number of possible sequences, which makes the glue programmable. 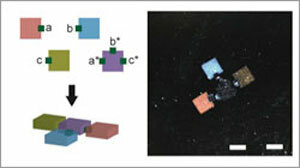 Gel bricks smaller than a grain of sand (top left) can be programmed to self-assemble into complex structures. The key is attaching connector cubes coated with matching DNA glue to the gel bricks that are meant to pair up. The researchers used enzymes to multiply a snippet of DNA into long pieces of DNA called “giant DNA” that contained multiple copies of that snippet. When they coated hydrogel cubes with giant DNA, the cubes adhered only to partner cubes coated with matching giant DNA. Since scientists can synthesize snippets of DNA with any sequence they want, this meant that giant DNA functioned as programmable DNA glue. This work was funded by the National Institutes of Health, by the Office of Naval Research, by the National Science Foundation, and by the Wyss Institute. In addition to Yin and Khademhosseini, the research team included: Hao Qi, a postdoctoral fellow at the Wyss Institute; Majid Ghodousi, a research assistant at the Wyss Institute; Yanan Du, a former postdoctoral fellow at the Wyss Institute who is now a Professor of Biomedical Engineering at Tsinghua University in Beijing, China; Casey Grun, an undergraduate researcher at the Wyss Institute, and Hojae Bae, a former Instructor of Medicine at Harvard Medical School who is now an Assistant Professor of Bioindustrial Technologies at Konkuk University in South Korea. The above story is based on materials provided by Wyss Institute for Biologically Inspired Engineering at Harvard University, Dan Ferber.